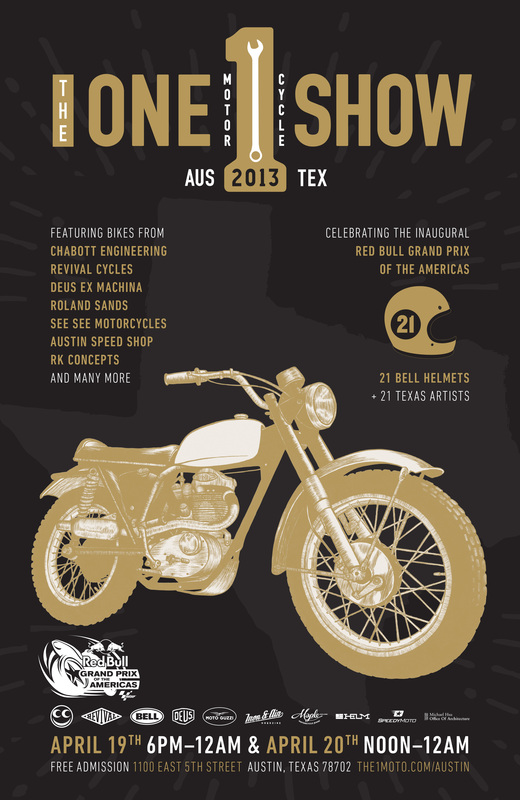 As part of the Red Bull Grand Prix of the America’s festivities, Lovers of motorcycles, art, music & design will descend upon East Austin when The One Show, an authentic showcase of custom motorcycles and one-off works of motorcycle helmet art makes its Texas debut Friday, April 19 through Saturday, April 20 at 1100 East 5th Street. Featured custom motorcycles will be provided by Austin’s own, Revival Cycles, See See Motorcycles, Deus Ex Machina, Roland Sands, Shinya Kimura and more. The One Show will also showcase the “21 Helmets” exhibit – a supercharged showcase of local Austin-based artists where motorcycle helmets are the canvasses for unique artistic expressions. The One Show & 21 Helmets events will be complimented by interactive games, southern fare, beer and live music from Leo Rondeau, The Texas Tycoons, Possessed by Paul James, Mockingbird Loyals and Joshua Bain. The One Show is a motorcycle show for motorcyclists by motorcyclists. The event originated four years ago in Portland, Oregon with the intention to unite the ever-growing motorcycle community and to celebrate the “One” bike that defines its owner and builder.